PCR Technologies, Inc. provides precision CNC machining of plastics and metals, for a wide range of applications and industries. 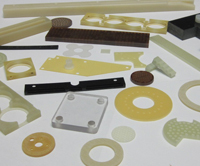 We possess the capabilities to work with virtually any type of thermoplastic, offering CNC machining, drilling, and routing, produced on high speed multi-spindle CNC machine centers. Specializing in thermoplastics we can also work with a variety of laminates such as low and high pressure laminates (resins) cotton cloth, paper based, and glass fabric based laminates (G-10, FR4). Providing precision manufacturing of parts up to 30" in length, 20" in height, and 20" in width, while maintaining positioning tolerances of +/- .0002", and repeatability of +/- .0001". CNC sheet routing can be performed on parts up to 48" in length, 24" in width, and thickness from .002" to 2". We also offer a wide range of secondary and finishing operations such as silk screen marking, assembly, engraving, painting, and mechanical assembly. PCR Technologies is a one-stop-shop for CNC machining of plastics and metals, we have the expertise and experience to handle the entire project. For more information on all of our CNC machining plastics and metals see the table below or contact us directly. AS 9102 F.A.I.R available upon request.